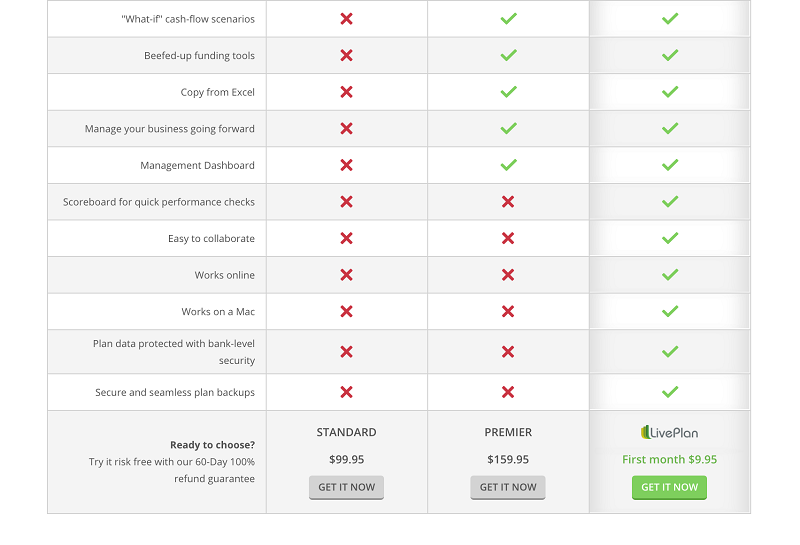 LivePlan vs Business Plan Pro Which is Better? LivePlan vs Business Plan Pro: Which is Better? On the hunt for the best business planning software for you? All the fieldwork involved proving more laborious than you expected? We’re here to lighten your load and streamline that research a bit. Based on countless hours of digging, we believe Business Plan Pro and LivePlan are two of the best options available to entrepreneurs today. 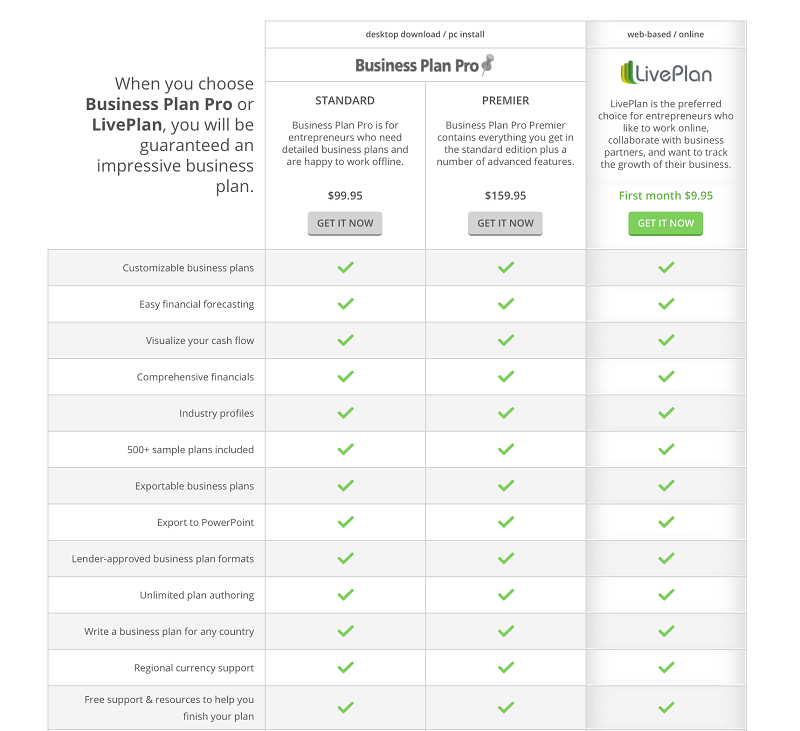 In this Business Plan Pro vs. LivePlan comparison, we’ll set the two side by side and talk about their similarities, differences, pricing and more. Let’s get to it! Both are designed by Palo Alto software. Renowned businessman Tim Berry founded Palo Alto in the late 80s and they’ve been in the business planning game ever since. Both Business Plan Pro and LivePlan include 500+ industry-specific sample business plans in their packages. Both come with a 60-day money back guarantee. Both offer live chat customer service, in addition to email and phone support. Both include educational content to help you get to know the software. Both allow you to import financial data from select accounting programs. Business Plan Pro has been around since 1991 and has helped over a million businesses. LivePlan was developed a handful of years ago in response to the user-demand for a more simplified version. Requires a one-time payment of between $99.95-$159.95 rather than a series of small, recurring payments. Comes with a series of helpful video tutorials led by business planning expert Tim Berry. Has to be downloaded to your computer, and will only be accessible via the device you download it on. Only works with Windows, so don’t try to download on a Mac! Over 400,000 businesses have used their services. Pretty incredible since they’ve only been around for a few years, but still nowhere near Business Plan Pro’s 1 million+. It’s cloud-based, so you can use it anywhere you’ve got internet access. This also makes collaborating with your team super-easy. Compatible with any OS, so it’ll work on your Mac, Android or PC. Step-by-step guidance all along the way, and an abundance of eBooks, tutorials, and other educational content. Has a performance scoreboard to keep you on track toward your goals, and an overall more streamlined, modern platform. BPP has some customer reviews, but not nearly as many as you would expect considering it’s been around for nearly three decades. It makes sense, though - the software gained credibility before online user-reviews became so powerful. Not terrible, but definitely a mixed bag of customer satisfaction. If you read through the reviews, you’ll notice a lot of folks complaining they wasted over $100 on a software that didn’t meet their needs or expectations. Of course, if they’d purchase BPP through Palo Alto directly, they’d have gotten a 60-day money back guarantee and avoided this issue. "Business Plan Pro was an essential tool during the strategic planning stage of our start-up. The profit and loss helped us focus our resources on the most profitable channels, and the sales forecasts were useful in keeping us on track." "The process forced a rigor into both the breadth and depth of our thinking about the business. The education we got as a result of using Business Plan Pro feels like it would be an MBA." 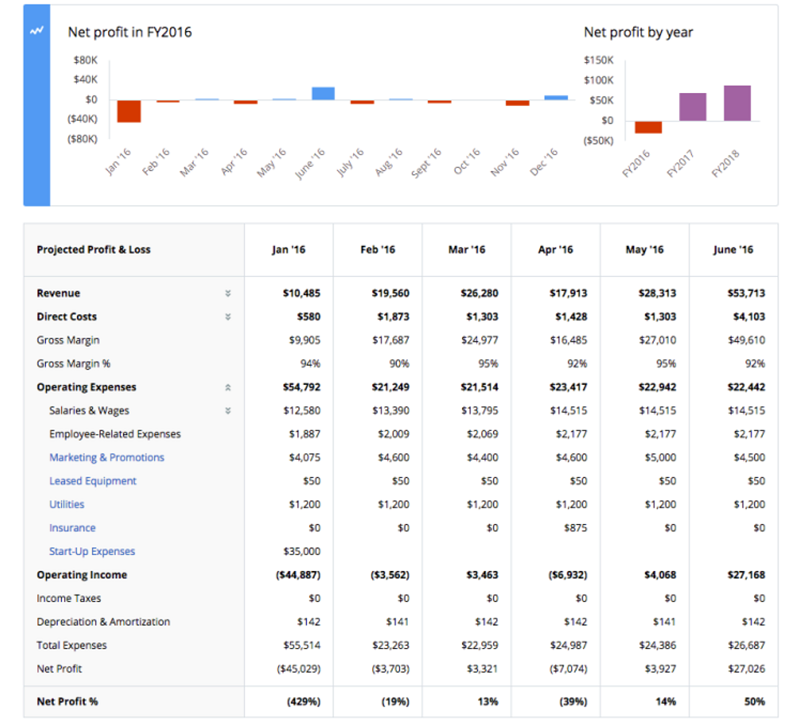 Business Plan Pro has been a great tool for over a million businesses since 1991, and it’s still the perfect choice for some business owners today. That said, it has some real limitations and isn’t immune to complaints in the era of modern, streamlined, cloud-based software. "LivePlan is awesome. I love what you guys are doing. You actually helped my startup win a national business plan competition! 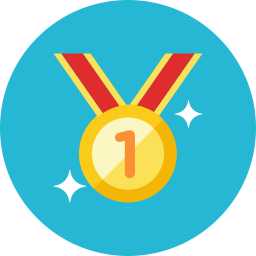 I've created a business plan by scratch on my own before and I was able to GREATLY reduce the time it took me to complete it using LivePlan." Frankly, there’s not much else to say about LivePlan’s customer reviews. They’re pretty flawless all around. Two downloadable packages: Standard and Premier. One-time payment of $99.95 or $159.95. 60-day money-back guarantee on either package. The extra $60 for Premier gives you the ability to copy from Excel, create hypothetical cash-flow scenarios, access their management dashboard, and a couple other perks. For an in-depth look at their pricing and features, check out our Business Plan Pro Review! Monthly or annual payments. Month-to-month costs $19.95/mo, annual costs $11.66/mo. Everything from BPP’s Premier package, plus a performance scoreboard, collaboration capabilities, higher data protection, and more. No need to download the software to your computer. Check out our comprehensive LivePlan Review for a more thorough examination of LivePlan’s pricing and features. 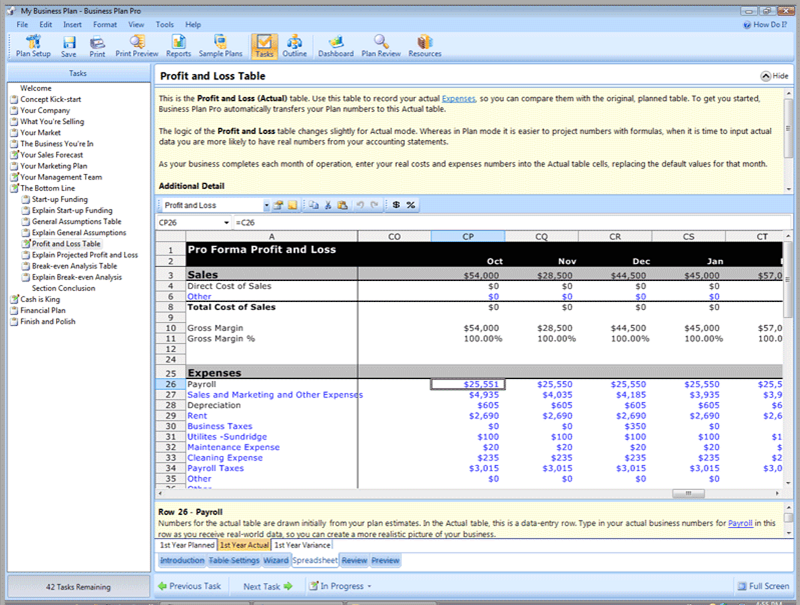 Business Plan Pro and LivePlan are two of the most reliable business planning software options. Together they’ve helped around 2 million businesses get on track. However, if you’re looking for cloud-based software, easy collaboration, month-to-month payments, or any other valuable features Business Plan Pro doesn’t offer, LivePlan is your best bet. Palo Alto Software is re-focusing their attention and putting their best foot forward.